EDF has announced preferred bidders for Hinkley Point C, with the contracts for larger components likely to go to French firms. How could UK industry participate more on future nuclear projects? Last week’s poll can only be described as deeply inconclusive. Despite a reasonably strong response, with 772 readers completing the poll, by far the largest group, almost 70 per cent, voted for none of the options we had suggested; and although we deliberately ask people who have chosen the ‘None of the above’ response to explain their choice in comments, only one of the 528 indecisive respondents did so, which makes it impossible to draw any conclusions. The helpful respondent said that he thought UK firms should have nothing to do with nuclear new-build until all of the waste from pevious generations of reactors had been safeky disposed of, although hew didn’t add any thoughts on how this could be achieved to his satisfaction. Although it is of course possible that his feelings were shared by the other 527, it seems unlikely in the light of previous polls and articles on UK nuclear, so we simply cannot say what other options we should have included to get a more conclusive response (it might be worthwhile to say that we can only give a maximum of six options in our online polls). 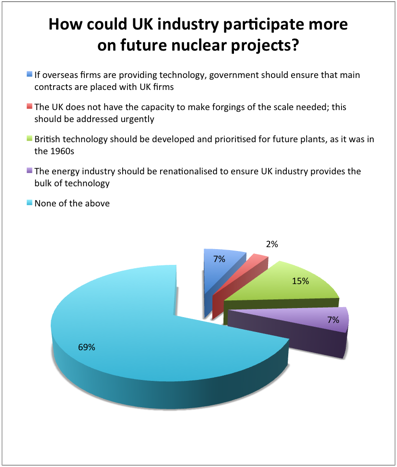 Of the 244 respondents who did pick one of our suggested options, the largest group, 15 per cent, said that future UK nuclear should follow the pattern of previous reactor generations, using technology developed in the UK to draw on a British supply chain. Two options tied on 7 per cent: the renationalisation of the energy sector to ensure that UK companies benefit; and that the government should ensure that main contracts are placed with UK forms. A further 2 per cent noted that UK forging capacity needs to be expanded so that it can handle the large steel components neeeded for nuclear installations. Our industry should be involved but why do we have wait for the Government? Too much blinkered concentration on the bottom line without any view of the Big Picture (UK economy-wise) has got us into the hole we’re now in. A major issue with nuclear technology is still the clean-up after use and accidents. Remote control technology, robots, video transmissions from highly radiated zones will be needed. As will be decontamination and storage technology. Get away from the unwanted European tender system which means other European countries can price their way into our market place, because we areforced to ask them itf they want to do it. Keep the jobs, know how, engineering and profits in the UK. Use our goverments money to support UK business. A resurgence in Manufacturing -and several generations of poor or inadequate management- almost by definition implies the new rise of Trades Unions: and there is one ‘party’ which having deliberately seen such off are NOT going to permit such to re-surge! because that would create a threat to ‘their’ continuous ‘right’ to govern for ever. Frankly, they have had their hands in the national ’till’ for so long they see such as their absolute Right (a pun intended). I have always recalled the comment from one Trades Union leader -when the grocer’s daughter managed to remove Unions from GCHQ- that “unless he was mistaken it was members of the so-called establishment/ upper classes/intelligencia who were the most active ‘turn-coats’ helping our enemies by defecting: from the Cambridge ‘set’ onwards. You ask “What has this to do with apparent encouragement for manufacture”? Don’t hold your breath! waiting for it. Like many ‘bankers’ who ‘just don’t get it….’ when considering actually making capital by making things…they Rightfully, just don’t get it. Why should they, they have riden the chrest of a wave of money for so long, they actually believe that is how it should be! Unfortunately the last board of directors of GEC (renamed Marconi) sold all its power engineering assets to its French second runner competitor Alstom in order to fund an ill fated gable on the dotcom bubble destroying jobs and pensions of 10,000 of hard working people. Then with GEC’s prized IPR and market share Alstom aggressively destroyed this unique UK asset to sustain its French factories and now we ironically use them as one of the prime contractors for this project. The question is predicated on the type of answer i.e. a reactor designed for nuclear submarines; that requires big forgings. I think we require cheap longlife reactors that are easy/fast to build, use natural uranium and have a recycling method too, to reduce waste. But a government/civil service that believes in not developing technology but (expensively) purchasing (and financing) foreign technology is not what we require. How about another option in the vote….that we should not have anything to do with nuclear power other than clean up the last mess we created. One of the voting buttons was related to the lack of forging capability in the UK. As I recall it, the government had a simple and cost effective opportunity a few years back to support a UK owned and based forging company entirely capable of supplying these items but failed to do so despite much pressure on them to keep this capability. Yet another failure by our governments to keep UK technology and capability going. I am not a nuclear engineer so my comments related to the on-going fiasco are based on press reports and not inside knowledge. As I remember it we sold our / Westinghouse PWR technology to Japan a few years ago in another well thought-out piece of UK energy policy. We are now buying all of our nuclear future from France (and French suppliers that they use), using an unproven, problematic technology with the fall-back position of using the technology that we sold to Japan. We have a well proven fleet of UK designed AGR based nuclear power stations that also serve Canada well and can design small PWR based nuclear power stations (submarine technology based). The pressure against AGRs was largely generated by Lord Weinstock in the 1970s for the next generation of nuclear stations (that were never built). I would be very interested to learn why we are not using our proven technology and manufacturing in the UK. Have the government got an anti-heavy-industry policy as all of the last generation of incinerators have been contracted from France and Denmark and all of our wind power stations use imported technology and plant. I have many friends in the industry. They may need to drag a few people out of retirement but the expertise is there to build our own. The government are just not listening. There is something distinctly fishy about the deals they are trying to do. It appears that the present ‘shower’ are intent on demonstrating this. MikeB – With the greatest respect….. Harold Wilson! It is not just the Tories, it is ‘government’ as a whole that is short-sighted caused by the need to be elected every few years. As I have said on here many times. We need an act of parliament that removes National, strategically technical decisions to an elected body of Engineers seconded from Industry and consultancies on a 3-year contract to manage all such matters.